Winter Nelis is a late-season dessert pear which keeps well through the winter. It is not perhaps the prettiest of pears, but with this is one you grow for flavour - few others come close. The Belgian city of Mechelen - more commonly known in fruit-growing circles by its French name of Malines - was a focal point for the development of new pear varieties at the start of the 19th century. Winter Nelis was raised here in the early 1800s and is arguably the best-flavoured of Belgian pears - although its compatriot Josephine de Malines is also extremely good. It was introduced to England in 1818, and rated by the Victorian fruit enthusiast Robert Hogg as "one of the richest flavoured pears". Please fill in the details below and we will let you know when Winter Nelis pear trees are back in stock. 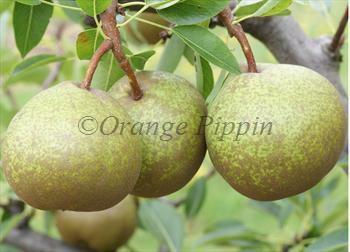 Another very good quality late-season pear - also raised in Malines. Winter Nelis is in flowering group 4. Winter Nelis is self-sterile and needs to be pollinated by another tree of a different variety nearby. Robert Hogg also notes one of the main drawbacks of Winter Nelis when grown in England - the flavour can fail to live up to is reputation. The main reason for this is lack of sunlight and warmth, and for this reason Winter Nelis is best grown in a sunny sheltered spot with a south-facing aspect. Wall-training on a south-facing wall would also be beneficial. Winter Nelis also benefits from being grown on a semi-vigorous or vigorous rootstock to counter its weak-growing tendency. Fruit size - and flavour - can be improved by thinning the fruitlets in early June. Winter Nelis was raised by M. Jean Charles Nelis of Malines in Belgium at the start of the 19th century.